Visitor Total Reaches Two Million! - Communication Plaza | Yamaha Motor Co., Ltd. Visitor Total Reaches Two Million! Mr. Nemoto and his family (center) received commemorative gifts from the Communication Plaza staff. We also offer many special exhibitions designed to introduce Yamaha technology with a child’s viewpoint in mind, family-focused educational programs for youngsters to experience and experiment with things like how engines and boats work and more. In recent years, we have also been receiving an increasing number of visitors from overseas, and in the process the Plaza reached a cumulative visitor count of one million people in its tenth year. 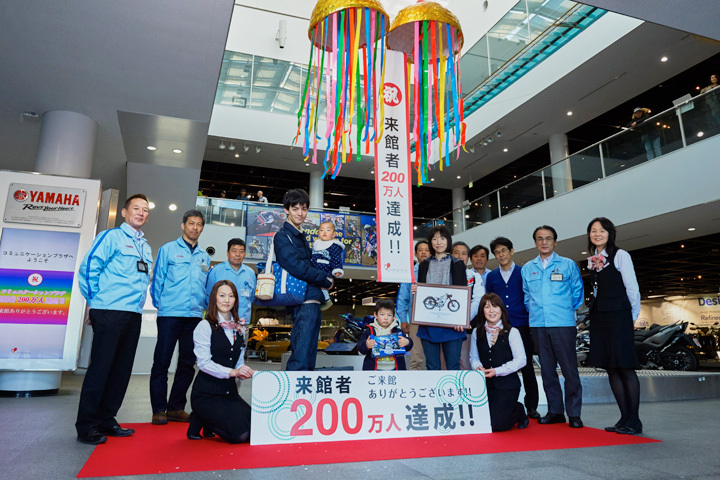 Last year as Yamaha Motor celebrated its 60th anniversary, the exhibit spaces of the Communication Plaza underwent a renewal with the aim of making its displays more familiar, visitor-friendly, visually appealing and informative. And, as the number of visitors coming to enjoy time at the Plaza has increased, we finally had the proud occasion to welcome our two-millionth visitors on Saturday, January 9th, 2016.